TOLEDO STEEL are back to full strength once more, having successfully recruited a new bassist to their ranks. “I first met Felix around twelve years ago,” recalls vocalist Rich Rutter, “and we both started to get into heavy metal around the same time. I think we quickly both realised that our passion for the music went beyond just listening to it, and the idea of starting their own band began to grow. After meeting Matt [Dobson – drums] and Kyle [House – guitars] we began jamming together and our first material was written throughout 2011 and 2012. Felix was involved in recording the very first demo and played with us at our first gig at The Joiners in our hometown Southampton in July 2012. “By mutual agreement Felix didn’t continue with the band after this largely due to him already having established Desolator where he was heading into more of a thrash/speed direction musically; he just wasn’t able to commit to the band fully, which is what we needed. However, he remained a close friend over the years and even shared the same bill with us on several occasions. After losing our bass player Nathan I suggested that Felix step in for the upcoming ‘Never Surrender’ UK tour in August. With the shows going really well and everyone having a great time on the road together this then turned into all of us asking Felix to stand in for the remainder of the year. 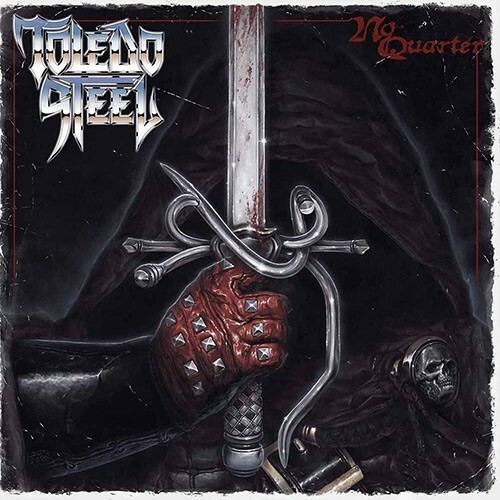 “No Quarter” is available on CD and to stream on all platforms via this link.